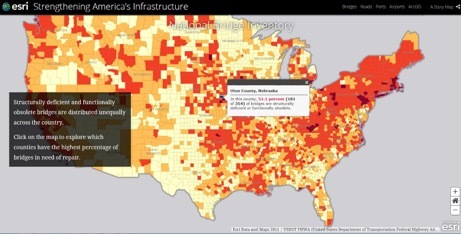 With the incoming presidential administration’s commitment to improving America’s infrastructure, Esri’s unique geographic information system (GIS) capabilities present an opportunity for national government figures to launch a forward-thinking program to restore the nation’s vast system of highways, bridges, airports, and ports. GIS can provide a common platform that would allow the US Congress, the administration, and the various state departments of transportation to share an understanding of the current condition of our nation’s assets, where the needs are greatest, and how we can identify the most strategic infrastructure investments to deliver the greatest benefit. Additionally, GIS provides an effective way to monitor the progress and performance of such investments and communicate the benefits to the public in an easy-to-understand fashion. Maintaining our critical infrastructure over time is also less costly when best practices in asset management are followed. And a precondition to effective asset management is having solid asset inventory and condition assessments, all managed and maintained in GIS. Analysis supported by GIS can help us understand trade-offs between different investments, ensuring that we target dollars to deliver the greatest impact. As such, GIS is a platform of insight that helps agencies make smarter investments in the future of American infrastructure. Learn more about how GIS can restore infrastructure—see the story map Strengthening America’s Infrastructure.